Robert Strachan, my great great grandfather, was born about 1808 and married (1) Margaret Haggerty b. 1808 and (2) Susan Cran or Kirkwood born about 1819. He had a total of 15 children. He was a coal miner in Ayshire. To see a larger version of any the documents and maps, just click on them. Typical, isn’t it? Of John Strachan and Agnes Neilson’s large family, only one baptism hasn’t made it into the records and it’s that of my direct ancestor Robert. From the age given in the census and his death certificate, Robert Strachan would have been born around 1808. In the census it says he was born in Riccarton, but that’s where he grew up. The sibling born before him was baptised in Banton, Kilsyth, Stirlingshire and the one after was baptised in Greenend, Coatbridge, Lanarkshire, so it’s unlikely Robert was born in Ayrshire, although given his parent’s propensity for moving it’s not impossible. But the family had settled in Riccarton by 1814, when Robert was about 5 or 6, so Riccarton would have been the place he remembered most from his childhood. After Riccarton, Robert went with most of his family to work and live at Shewalton Colliery, in the parish of Dundonald. Robert’s mother Agnes Neilson died when he was about 18. By then Robert would have been working down the coal mines for several years: he would have started as young as 7, working as a drawer for his father or one of his older brothers, but by 18 would have been a coal hewer in his own right. On 22 August 1828, when he was about 20 years old, Robert married Margaret Haggerty. Margaret came from a coal mining family too, and the Haggerty family also lived and worked at Shewalton Colliery, so Robert married a neighbour’s daughter. The elder children of Robert and Margaret can’t be found in the baptism records, but that could be because there wasn’t a minister at Dundonald for a few years. Intriguingly, however, their daughter born in about 1830 gives Govan, Glasgow as her birthplace in the later census, so perhaps Robert and his family spent a short while there. Their younger children were baptised in Dundonald parish and their baptism records state that Robert and Margaret were of Shewalton Colliery. In 1841, the family is in the census at Shewalton Colliery, by then part of the parish of Fullerton which as the census said, “lies between the Water of Irvine on the east, sea on the west, Dundonald and Troon parishes on the south, and Guthries Farm on the north.” Guthries Farm is immediately south of the town of Irvine, so Shewalton Colliery was closer to Irvine town than it was to Dundonald village. Robert and Margaret, with 8 children aged from 14 years to 8 months, would have lived in a miners’ row, probably of only two rooms – the kitchen and ‘the room’. See separate page under Articles tab about Shewalton Colliery – it sounds like a good place to live and work compared to other collieries, which may explain why the Strachans and so many of their relatives stayed there for some time. Below is the Thomson map published in 1832: the pits of Shewalton Colliery were located in the pink section below the river, where it says “Shewalton Moor”, next to the road leading to Irvine. 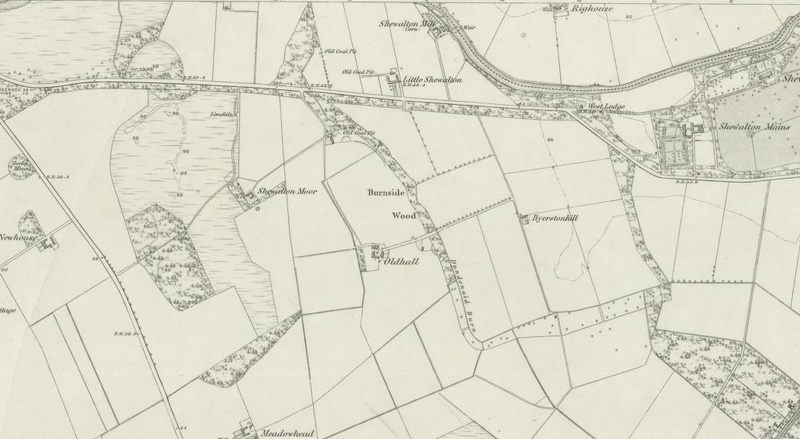 The next map, from an OS survey in 1856, shows only old coal miners at Shewalton, which explains why all the Strachans had left Shewalton by 1851: the mines had closed down. Robert and Margaret moved to Kilwinning parish not long after the 1841 census was taken, as did many of their relatives, as many new pits were opening in the area to the east of Kilwinning town. Margaret Haggerty sadly died there in July 1846, from fever, at the age of 39: her death information was provided to me by another researcher so I’ve not yet seen the parish register entry for myself. The fever could have been typhus or cholera, as both reached epidemic proportions in Ayrshire around this time. Robert became a widower: his youngest child was only 3 years old and there were 7 children age 16 and under. His three eldest children were girls and no doubt at least one of them became housekeeper and carer of the younger children. It’s not surprising, though, that Robert remarried, and it’s likely his second wife had been living with the family as housekeeper for some time, as she’d given birth to her first child with Robert 4 months before their marriage. Robert Strachan and Susan Cran were married in Kilwinning parish on 13 July 1850. In 1851, Robert, Susan and 5 children are living at Moncur Row, Kilwinning. This is to the east of Kilwinning town, and there were several coal mines in the area. Today there is a Moncur Road running off Corsehill, at the eastern extremity of Kilwinning. In 1861 they are at Kenneth’s Row, Kilwinning – a location very popular with Strachans and other coal mining ancestors during the mid 1800s. In 1861 many of the older children have left home but several younger ones had arrived to take their place, and the household contained 8 children, as one daughter was living back at her home with her baby, and Susan had just given birth to her youngest. They are still at Kenneth’s Row in 1871, but only 4 children are still at home, and Robert is a disabled coal miner. The disability is possibly the chronic bronchitis given 6 years later as the cause of his death. The family is spread over two pages in the 1871 census – I do wish ScotlandsPeople didn’t charge you twice when that happens. Note that at the top of page 1, living a few doors away from Robert Strachan, is Mary McEwan age 35 and Margaret Strachan wife’s daughter age 10. Mary is the daughter of Robert Strachan and Margaret Haggerty. They were a close-knit family and community. Also note that a lot of the young daughters earned money by knitting the famous Kilmarnock bonnets. 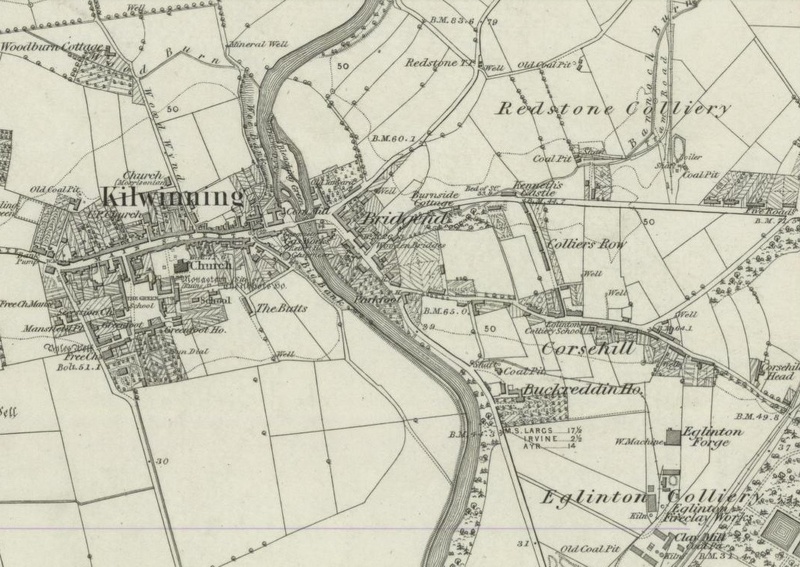 Kenneth’s Row can be found on the OS map below, published in 1860, to the east of Kilwinning town and running in a line south of Kenneth’s Castle, and named Colliers Row. The colliery school is to the south of the rows, and there are coal pits to the north and south. Much of the coal was used to fire the furnaces of the Eglinton forge and fireclay works. Kenneth’s Castle wasn’t a castle – it was a house built by the side of the main road and was occupied by a colliery manager. Robert Strachan died on 17 May 1877, at the age of about 70 at Kenneth’s Row – it says 71 on the death certificate but that is the age the informant, his son, gave when registering the death. Robert died from chronic bronchitis, a not surprising condition for someone who had spent more than 60 years working in coal mines. Another researcher has told me Robert was buried at Brigend Cemetery, Kilwinning although there is unlikely to have been a headstone as the family wouldn’t have been able to afford one. See the Haggerty page for details of her family. Margaret was born at Glenbuck, near Muirkirk, the daughter of Joseph Haggerty, a coal miner, and Jean Orr, who had moved to Shewalton before the 1828 marriage of Margaret to Robert. Margaret had 9 children with Robert Strachan between 1828 and 1842, but sadly died in 1846 from fever, at the age of 38, in Kilwinning. 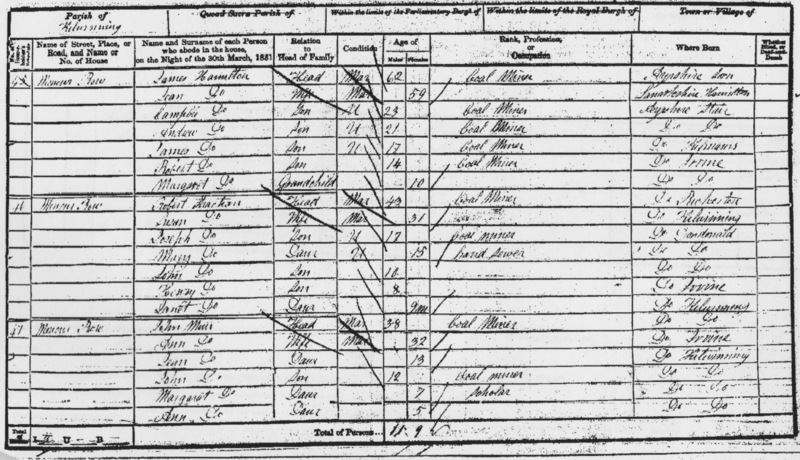 There is no baptism record for Susan, who would have been born in about 1819 at Kilwinning according to the census, but her death certificate states she was the illegitimate daughter of Jane Johnston ms Kirkwood, with no father mentioned. Jane Johnston is also named Jean Johnston in the census. However, there is a baptism in 1813 in Kilwinning for John Cran, son of Alexander Cran and Jean Kirkwood. So Susan could have been the daughter of Alexander Cran and Jane/Jean Kirkwood, who had at least one other child, though it seems Alexander Cran may not have been married to Jean/Jane Kirkwood. It’s also possible that Jean Kirkwood married Alexander Cran, had son John, Alexander then died, and Jean had an illegitimate child called Susan who bore the surname Cran. Susan Cran’s mother Jean Kirkwood was born in 1785, the daughter of Alexander Kirkwood, a sexton, and Susan Brown. A sexton was a church caretaker and/or gravedigger. Jean Kirkwood married William Johnson in 1833 and in the 1841 census her daughter Susan is listed as Susan Johnston. Susan Cran was about 30 years old when she married Robert Strachan and there is no evidence for her having been married or had children prior to the marriage. Robert and Susan lived in Kilwinning and had 6 children together. Susan’s mother and stepfather also lived in Kilwinning, but her mother must have moved to Kenneth’s Row, where Susan and Robert Strachan lived, when she was widowed and she may have lived with Robert and Susan, as that is where Jean Johnston ms Kirkwood died in 1871, and the informant was her grandson, Robert and Susan’s son. Robert Strachan died in 1877 at Kenneth’s Row. In 1881 Susan is still at the same house at Kenneth’s Row with 2 of her sons, the daughter of one of her sons, her stepdaughter Mary and Mary’s 4 children. Susan Strachan died on 7 August 1881 at Kenneth’s Row at the stated age of 57 (she was probably nearer 63) from something difficult to read but looks of scirrhous: a tumour and probably cancer. So on to the story – or at least the stories I’ve been able to discover – of the 15 children of Robert Strachan. There is no baptism for Charlotte though she would have been born at Shewalton Colliery. She’s in the 1841 census with her parents and siblings, age 14 (though ages given in the 1841 census are not very accurate). There is nothing else to be found – no marriage, and no death after official registration started in 1855. The assumption to be made is she died some time between 1841 and 1855. Did she die of the same fever that took her mother’s life in the 1846? Again no baptism can be found but she would have been born at Shewalton Colliery, and is there with her parents and siblings in 1841. Her mother died in Kilwinning 1846. Agnes married William Kean or Cain at Kilwinning in 1850. William Kean was born in Edinburgh, according to the census. In 1851 Agnes and William are at 8 Crescent Row, Eglinton Iron Works, Kilwinning and William is a coal miner. By 1861, where their surname is written Cain, they’re at 53 Single Row, Kilwinning and have 4 children John, William, James and Rebecca. They had moved to 42 Byrehill Row, Kilwinning by 1871 and had another 3 children named Joseph, Robert and Henry, and were still there in 1881, along with visitor Margaret McKay and a grandson Robert Cain, who was the illegitimate son of their daughter Rebecca. William Kean died in 1887 at the age of 59. In 1891 Agnes Cain is still at 42 Byrehill Row, Kilwinning but the head of the household is her son John Cain, a coal miner with his wife Mary and 7 children; Agnes Cain age 62 born Dundonald is an outdoor worker. 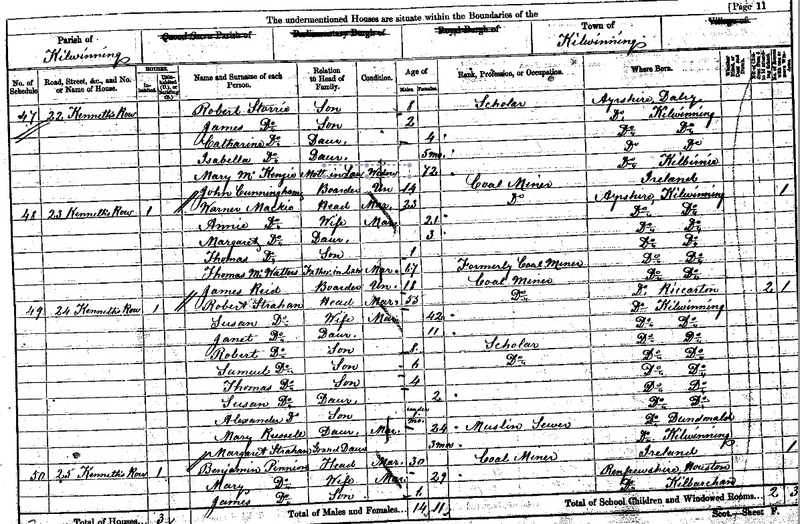 Can’t find her in the 1901 census, though it’s possible she’s the Annie Strachan age 72, living and working as a servant with Elizabeth Dyet age 77 at the Eglinton Arms Hotel, near Abbey Gate, Kilwinning as at the moment I can’t work out who else it could be and the names Aggie and Annie are easy to mix up. Agnes died in 1905 at Cunningham Combination Poorhouse, Irvine, of senile debility, which these days we would refer to as dementia. Agnes and William Kean had 9 children, 3 of whom died in childhood. All the surviving boys became coal miners, but it’s puzzling that most of them disappear from the records after 1881. They could have migrated, but I haven’t been able to find any evidence for that yet. The eldest child, John Kean, married Mary O’Neil, stayed in Kilwinning, and had 10 children. Daughter Rebecca Kean married coal miner John McLure, had 6 children, and moved to Lanarkshire. Jean, sometimes Jane, Strachan was born about 1830 in either Dundonald, or in Govan, Glasgow, the latter being where it says she was born on the census. She married James King in Kilwinning in 1849 and had at least 6 children. James King was a hand loom weaver of cotton in Kilwinning. The birth places given in the census for their children indicate quite a few moves, to Dalry, then Glasgow, then back to Ayrshire to Irvine, where they remained. By 1881 James King is a labourer in a brickfield and in 1891 is a stove stocker. Jane King ms Strachan died at Perceton Row, Dreghorn age 67 of bronchitis. They had 11 children. The eldest, Jean King, married coal miner William Stewart, had children, migrated to Alabama, USA and died there in 1927 age 76. Next was Margaret King who married coal miner William Taylor, had children, moved to Riggend, Lanarkshire in about 1881 and died in Partick in 1923 age 68. Son Joseph King started out as a coal miner, married Margaret Brown and had children, but by 1891 had settled in Irvine and become a stone mason. He died in 1928 at Irvine. Daughter Elizabeth married coal miner James Davidson, lived in Kilwinning and had 3 sons, but she died age 28 in 1887. Her husband remarried and the family migrated to Oklahoma, USA. Next was son James King who died age 2. Daughter Mary King lived in Irvine all her life, where she married blacksmith David Mitchell, had children and died in 1926. Son Robert King become a coal miner then migrated to USA in 1887 where he went to Alabama. He married Maggie, had no children, and lived and worked as a machinist, furnace boiler operator and finally watchman, living in Fairfield, Alabama not far from his sister Jean Stewart ms King. The next 3 children all died in childhood: daughter Janet Thompson King born 1867 died in 1869 age 2, son John King born 1870 died in infancy and daughter Annie King born 1873 died in 1879 age 6. The last child, daughter Cecilia Whylie King, was born in 1875 (the registrar wrote her name as Zelia) and was with her elder sister Margaret in Lanarkshire in 1891. In 1894 Cecilia married coal miner Thomas McMurtie at Dreghorn, had children, and the family migrated to Vancouver, Canada in 1898. In 1902 they moved over the border and settled in Rock Springs, Wyoming, USA and had more children. Thomas McMurtie worked as a coal miner until at least 1930, and Cecilia died at Rock Springs in 1938. Joseph is my direct ancestor, my great grandfather, and was born about 1833 at Shewalton Colliery. His story will be told on another page. Briefly, he married Jeannie Haddow, had 9 children including my grandfather Henry Strachan (Harry), worked all his life as a coal miner, and settled in Crookedholm, near Kilmarnock, Ayrshire where he died in 1895. Mary Strachan was born about 1835 at Shewalton Colliery where she is with her parents and siblings in 1841. Her mother Margaret Haggerty died when Mary was about 11 years old, and in 1851 Mary is in Kilwinning with her father, stepmother and siblings, age 15 and a hand sewer. In 1855 she gave birth to an illegitimate son, Robert Strachan, at Springside Row, Dreghorn and the birth certificate says father’s name refused. In February 1857 Mary married able seaman Archibald Russell at Stevenston, and at the time Mary was working in Ardrossen as a domestic servant. Her son Robert died age 2 in 1858 in Ardrossen, and is named Robert Russell on his death certificate. Archibald Russell can be found on Merchant Navy lists prior to 1857 and obtained his Master’s Certificate in 1856, but after his marriage in 1857 he disappears from the records. Mary Strachan, the name she gave for the certificate, registered the birth of an illegitimate daughter in January 1861 named Margaret Strachan, father not named. 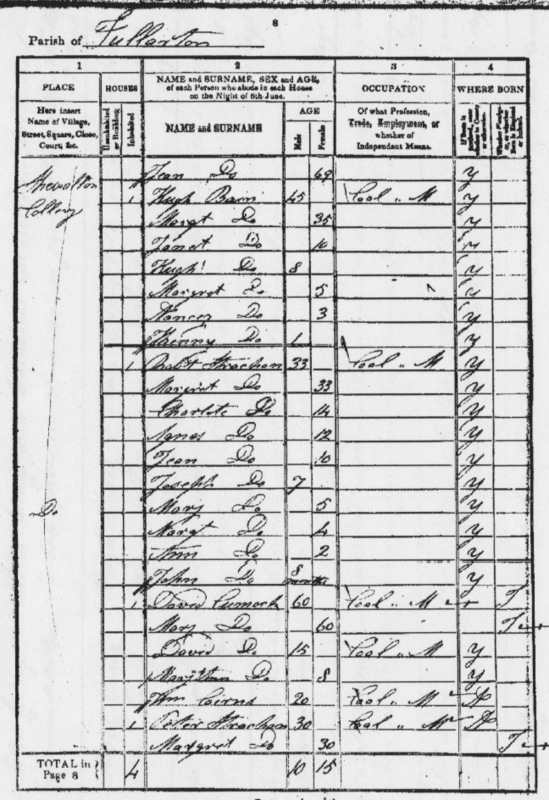 In the 1861 census she is listed as Mary Russell, muslin sewer, and is living with her father, stepmother, siblings and 3 month old daughter Margaret. Then in 1871 she is in the census as Mary McEwan, at Kenneth’s Row, Kilwinning, wife of Alexander McEwan coal miner from Perthshire. With them are three children: Margaret Strachan age 10, and sons Andrew McEwan age 4 and Robert McEwan age 2. Alexander and Mary weren’t married, though, as they didn’t marry until 1883. In 1881 Mary Strachan visitor is with her stepmother Susan Strachan and younger half siblings, along with Mary and Alexander McEwan’s 4 children, whilst Alexander is boarder in Old Monkland, Lanarkshire, working as a coal miner. Mary and Alexander married in 1883, both living at Kenneth’s Row, Kilwinning, with Mary described as Mary Strachan widow and a field worker. Perhaps she and Archibald had separated, and Archibald died just before 1883, but no death record can be found for him. In 1891 the family are at Brick Row, Kilwinning, and in 1891 Mary McEwan age 62, outdoor worker, is with married daughter Marion Hamilton at Single Row, Kilwinning and Alexander McEwan age 60 labourer is with married son Andrew McEwan in Double Row, Kilwinning. Mary McEwan ms Strachan died in Kilwinning in 1909, age 74. Daughter Margaret Strachan married brickmaker Robert McGown in 1881 at Kilwinning at the same time and place as her stepaunt Susan was married – a double wedding. Robert McGown and Mary lived in Kilwinning and had children, and Margaret McGown nee Strachan died in Kilwinning in 1940. Son Andrew McEwan became a coal miner, married Janet Kirk, had children and lived in Kilwinning, and son Robert Strachan McEwan was also a coal miner in Kilwinning, married Christina Walker and had children. Daughter Marion McEwan married coal miner James Hamilton, had children and lived in Kilwinning: in 1901 her mother Mary is with her as Marion had just given birth to her 4th child. Youngest child Daniel married Sarah Strannigan and moved to Bellshill, Lanarkshire where he worked as a coal miner. Born 7 December 1836, Margaret Strachan worked as a farm servant at Springside, Dreghorn and it must have been through this work that she met Andrew Chapman, a farm servant from Old Cumnock, whom she married in 1857. Soon after they migrated to New Zealand and became a founding family of the settlement at Balclutha, near Dunedin. There’s a lot of historical information about Balclutha online which shows that the Chapmans were on the electoral roll at Barr’s Extension Land in 1875, lost a son in a drowning accident in 1878, and ran the stables at the Crown Hotel. A newspaper article dated 1904 details the accidental death of their son-in-law Francis Joseph, a journalist who was hit by a large stone at the opening of a harbour scheme involving an explosion. It seems Andrew and Margaret Chapman had a successful life in New Zealand, but it was not without its traumas. Ann Strachan was born at Shewalton Colliery in 18 September 1838, is with her parents and siblings in 1841, and is with the McInnes family at The Green, Kilwinning in 1851 as a domestic servant age 12. In 1861 she’s a visitor, along with her cousin Ann Strachan, with Alexander and Janet McDonald nee Stewart at West Thornton Hamlet, Dreghorn: the McDonalds were likely to have been related to at least one of the Anns but I’m not sure how. Then Ann becomes elusive: I’ve not been able to pin down a marriage or death for her. There are some possibilities but nothing proven without spending a fortunate a ScotlandsPeople! Born 26 October 1840, John is with his family in 1841 and 1851, and in 1861 is a coal miner lodging with the Muir family at Slate Row, Kilwinning. In November 1861 he married the daughter of the family he’d been lodging with, Jane Muir. In 1871 they’re at Burn Row, Kilwinning, with John a coal miner, and in 1881 are at Southook Row, Dreghorn and John is an ironstone miner, and they are still there in 1891 although John is mining coal again. By 1901 they’d moved to Auchinleck and John is a retired coal miner: several of their children also moved to Auchinleck. He died in Auchinleck in 1902. His eldest child Margaret Strachan is possibly the one who became a dairymaid at High Moncur Farm, Kilwinning and is there is 1891 and 1901. Nothing for her after that, though. Son John Strachan became a coal miner, married Margaret Holmes and moved around for work, to Ochiltree and then to Bothwell and Bellshill in Lanarkshire. He died in Bellshill in 1937. Daughter Annie married coal miner Robert Whiteside, who became a colliery oversman in Auchinleck and then a colliery manager in Coatbridge, Lanarkshire. They had 2 children. At some stage they moved back to Ayrshire as Annie died in 1947 at Old Cumnock. Daughter Janet Strachan worked as a domestic servant in Irvine in 1891, age 22, but I’ve yet to trace her after that. The next child, Robert Strachan, died soon after his 1870 birth. Daughter Jeanie Strachan became a dressmaker and had an illegitimate son, Andrew, in 1895. In 1891 they are both living with Jeanie’s parents and in 1911 are with her younger brother Robert in Auchinleck. She died in Auchinleck in 1946. Next was Agnes Strachan who I think was the Agnes who was a domestic servant in Galston in 1891, but I haven’t been able to trace her any further. Then there was Charlotte Strachan, who at age 13 was a domestic servant with the family of James Kirkwood: Charlotte’s step-grandmother was a Kirkwood so they could have been relatives. Charlotte married agricultural labourer James Hamilton, had children, was living in Dreghorn in 1901 and died in 1951 age 73 at Symington, Ayrshire. Youngest child of John and Jean was Robert Strachan, a coal miner, who moved with his parents to Auchinleck and was living there with his sister Jeanie in 1911. He married Agnes Stirling and died in Auchinleck in 1931 at the age of 50 of acute bronchitis. Henry or Hendry Strachan was born 1 October 1942 at Shewalton Colliery. His mother died when he was very young, and in 1851 he’s in Kilwinning with his father, stepmother and siblings. He seems to have been missed off the 1861 census but was most likely to be in Kilwinning, as that’s where he married Elizabeth Black on 9 June 1865. Henry was, of course, a coal miner. By 1871 Henry and Elizabeth and their children were at Barr’s Land, Riccarton, which was in the Hurlford/Crookedholm area, and they remained there. Several relatives, including my great grandfather, Henry’s brother Joseph, also joined him as neighbours in Crookedholm, all working in the coal mines. This possibly had something to do with the Strachan connection to Allan Gilmour, who became a coal mine owner in Crookedholm and Galston. Henry had 9 children and died in 1920 age 77. Eldest child Robert Strachan was a coal miner and lived in Crookedholm with his parents and siblings until 1891. He married Jane Gallacher from Galston, had two sons Charles and William, and then died of Addison’s Disease in 1899. In 1923 his widow migrated to Canada, then went to Detroit, USA in 1925 and in 1930 is living with her son Charles Strachan, his wife and children. The second child of Henry and Elizabeth was named Isabella Gilmour, indicating the link to Allan Gilmour coal mine owner. She married coal miner Robert Govans, had children, lived in Crookedholm and Galston, and died in Crookedholm in 1937 age 70. Third child William Black Strachan was a coal miner, married Helen Tonner, had children and lived in Crookedholm, where he died in 1926 age 56. Daughter Carolina Black Strachan married coal miner Peter Cowan, had children and lived in Crookedholm, where she died in 1939. Next was Margaret Strachan who married coal miner Hugh Flynn, had children and lived in Stair, Ayrshire at marriage and in 1901. They had children but I haven’t tracked the family beyond 1901. Daughter Annie Strachan died in 1884 age 8 of effusion of blood into the brain. Henry or Hendry Strachan, coal miner, married Elizabeth Cunningham in Auchinleck, had children and died in 1962 age 83 in Hurlford. Youngest child Annie Strachan married Robert Young, had children, lived in Hurlford and died there in 1950 age 69. Janet was born 30 March 1850 at Kilwinning, 4 months before her parents got married, and she grew up in Kilwinning. Before her marriage she was a bonnet knitter, then married coal miner Thomas Docherty in 1872. The family are at Corsehill, Kilwinning in 1881 with 5 children, then in 1886 they migrated to the USA and settled in Pratt City, Alabama. Her husband died there in 1895 and Janet remarried to James Grant, who was also from Kilwinning and a widower. They are in the US census in 1900 and 1910. Janet died in 1920 at Birmingham, Alabama. Janet and Thomas Docherty had 8 children, the last 3 being born in Alabama. I’ve only researched some of their children. Thomas Docherty married Maggie and was first a coal miner in Alabama, then moved to Illinois. Robert Docherty married Norena and lived in Alabama, working as a fitter for a railway carriage builder. Edward Docherty married Maggie and was a coal miner in Illinois. Robert Strachan (yes, yet another one) was born about 1852 in Kilwinning – no baptism record found – and married Margaret Brown. 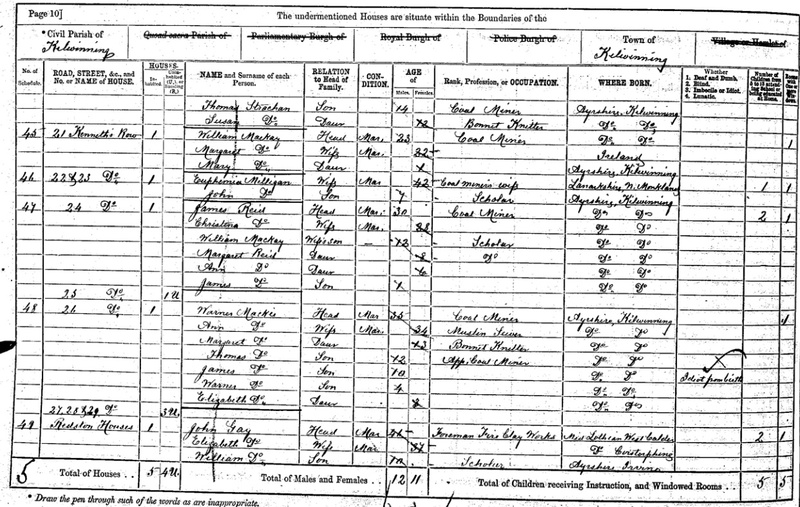 He was a coal miner and lived in Kilwinning up until the 1901 census, and had 6 children. He died in Stevenston in 1940 at the age of 88. No baptism record found for Samuel Strachan but he was born about 1854 in Kilwinning. A coal miner, of course, he married Elizabeth Wallace, worked and lived in Kilwinning at Corsehill Row, had 8 children and died in 1921 age 66 in Stevenston. I haven’t done much research on his children as most of them were still young enough to be living at home in the 1901 census, and tracing them beyond that means spending far too many credits on ScotlandsPeople. I’m waiting for the 1911 census for Scotland to be available at a much lower cost! However, the index on ScotlandsPeople, which only costs 1 credit to search, provided some information on the eldest two. Daughter Elizabeth Strachan married coal miner William Bain and lived in Kilwinning, but died age 31 of tuberculosis. Son William Strachan, a coal miner, is probably the one who married May Kelly in 1904 and died in 1927, both events at Kilwinning. Thomas Strachan was born 3 October 1856 at Kilwinning and is at Kenneth’s Row with his parents before his marriage to Mary McLachlan. He was a coal miner, lived in Corsehill Row after his marriage, with many relatives as neighbours, and had at least 6 children. He died in Kilwinning in 1911 age 54. Susan Strachan was born 19 December 1858 at Kilwinning, and married coal miner Peter Lawson. They had 6 children before Susan died in 1894 at the age of 38. Her widower Peter remarried. 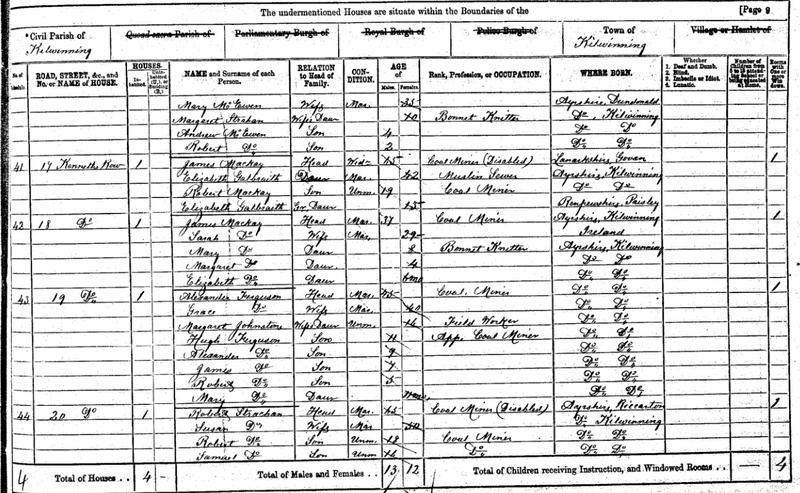 Alexander Strachan was born 26 March 1861 at Corsehill, Kilwinning and is with his parents a few days later in the 1861 census. But he’s not in the 1871 census or any other records, though no death record can be found for him. There are still many Strachans in Crookedholm – Hugh and Patsy being neighbours – Hugh played football for Partick Thistle before taking over the local shop. It would be great to hear from you. Hi Fiona, and welcome to the blog. Yes, those names appear on many a downloaded record as neighbours of my ancestors, and I have a Strachan ancestor who married a Ballantyne. I was so interested to read you were born in Crookedholm! I’ve only ever been once – and admit to driving through it before I realised where I was and then had to turn back – as my grandparents moved to Cambuslang before my father was born, so as a child we never went to Kilmarnock, though did have holidays at Troon. I was born and live in England. Your family sound as if they were coal miners too, given the locations. 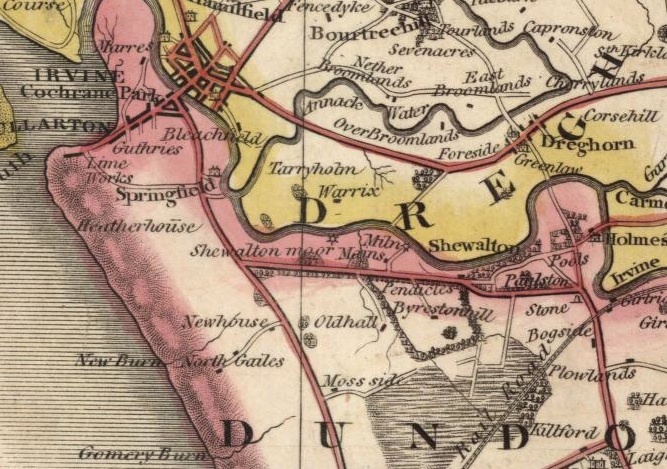 If you know any Strachans in Crookedholm please tell them about this blog, as they are surely related somehow, and it would be lovely to find out out and discover relatives who stayed put in Ayrshire! I’m now about to go an have a look at your blog. Hi Judy – great to hear from you. There are lots of Strachan’s in Crookedholm and I will pass on the link to your blog! I can guarantee that if here was a Strachan/Ballantyne marriage then we must be slightly related somewhere along the line! Considering how many of our ancestors seemed to be neighbours, it’s not so surprising. I’ve only completed one blog post on my great grandmother Sarah Kilpatrick, but I’m thinking about keeping a Family History blog…at least it keeps all of the info in one place and allows others to share. I have two very time costuming writing blogs so I’m a bit apprehensive about starting a third! I’ve become very interested in the social history surrounding my ancestors and even my mum who is now 80 has told me some incredible stories that she’s never mentioned before – people just got on with life in the most awful circumstances. If I can help you with any information about Crookedholm, please just ask. Thee is a good Crookedholm village page on facebook which I have joined. You might like that. Hi Fiona – lovely to hear from you again. My Strachan/Ballantine alliance goes back to when Susannah Strachan married Thomas Ballantine in 1829 in Kilmarnock. I think he was the son of Robert Ballantine and Janet Campbell and was born in 1806 in Airdrie.They had at least 9 children. I read your post about Sarah Kilpatrick and loved it. We share the same interest in wanting to add stories to the names and dates on the family tree. I’ll have to have a look at the Crookedholm address for my Strachans in the census, and ask you where those places might have been and if any or the buildings still remain, though I imagine it’s now a very different place to what it was over 199 years ago. I’ll see if I can find the Crookedholm page on Facebook. Hi Judy – I must check out that marriage – my father is Ballantyne and my mother is Campbell….this could be interesting. Although the Ballentynes around 1820 were shepherds and the Campbells still in Fife…it’s so interesting. Some buildings still remain in Crookedholm but it’s very different rom the old photos. Great to have made this connection with you and thanks for reading my post on Sarah. Thought I’d post a list of places in Crookedholm my ancestors lived in, from about 1850 to around 1910. Do any of them sound familiar? Also, my grandparents were married at the Commercial Inn, Hurlford in 1896. Do you know whether the building still exists? Judy, the Lamont’s were a family — I know that Janet (nee Stevenson) Lamont died 1863 at High Moncur Farm with her Daughter Janet Lamont and son-in-law David Murdoch. Perhaps the family also owned land elsewhere that was casually called Lamont’s Land? Hi Meghan, and apologies for not replying earlier. That’s interesting. I have ancestors living in several places that were called “someone’s” land, so I suspect you are right – the place was named after whoever owned the land. Miners’ Rows were built very close to the coal mines, which were usually on what had been farm land, so perhaps the Lamonts owned, or were tenants, of the land that was used to build the houses. Thanks for stopping by and leaving a comment. Hi Judy, Justt sttarting o do my family tree but tthe 1851 census shows my great great great grandfather Mclauchlan as living at 9 Crescent Row Kilwinning beside a Kean family !!! Hello,I am Lex Mcewan and my grandfather was Alexander strachan hannigan Mcewan. Mary Strachan was certainly my ancestor and it was good to come across your blog.I hope you are well and I would be interested in finding out more. Thank you very much for all the info on my Brother-in-laws Family History The Strachan’s are from his mums side and his mum has Susan and Strachan in her name. His sister is also called Susanne . The information you have is amazing , I’m going to enjoying passing over The Strachan Family history to him.